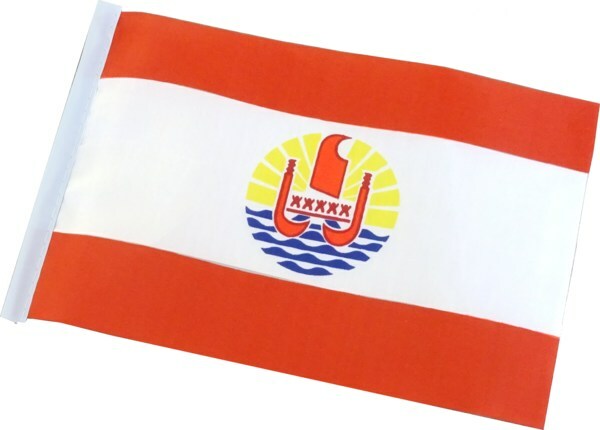 For lovers of Polynesia, associations and all collectors (flag, banners and pennants). This decorative flag is made of polyester fabric that restores colors to the front and the back. Generally used indoors, it can be used occasionally outdoors. A sheath of 4 cm (0.13 ft) is provided over the entire left width to insert a shaft (not provided). Size unfolded: 150 x 90 cm - 4.92 x 2.95 ft. The flag of French Polynesia was adopted in 1984 and officially recognized by the French Republic. Symbol of freedom, recognition and rallying for Polynesians people, it marks the identity of the Country. - the Polynesian double pirogue with sail (front view): emblem of people of the sea, essential for fishing, transport and communication between islands. - the five tikis: which represent the 5 archipelagos (Society, Tuamotu, Gambiers, Australs and Marquesas). - the red color: refers to maro ura, the red feather belt that only members of the royal family were allowed to wear. - the rays of the sun: symbol of life. - the waves: symbol of wealthness of the sea.